Wield ultimate control over your screen brightness with this nifty tweak. The jailbreak community has always been striving to improve the way iOS handles system settings. iOS 5 failed to introduce a quicker way of managing preferences like screen brightness and Bluetooth, and jailbreakers still use tweaks like SBSettings to toggle prefs without popping into the Settings app. More elegant solutions for enhancing iOS have started coming out in Cydia over the last year or so, and a jailbreak tweak called Swipebright brings very useful functionality to the status bar. With the quick flick of a finger, you can control screen brightness right on your iPhone’s status bar in iOS. 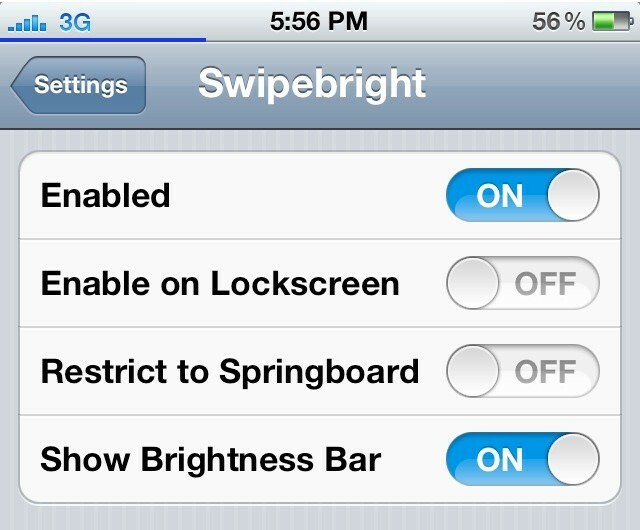 You never have to tap anything or initiate something like SBSettings; Swipebright works wherever you are. When you put your finger on the status bar and start swiping, a little blue bar appears to indicate how much brightness you have left. No percentages are displayed, but you see your screen become dimmer or brighter as your finger moves. There’s plenty or customization to be had in the preferences pane of the Settings app. Swipebright can be enabled for use on the lock screen, making it easy to just swipe across the top of your screen to adjust brightness without unlocking your iPhone. You can also hide the blue indicator bar if you feel the need. The “Relative Adjustment” section of the Swipebright preferences controls how quickly screen brightness adjusts with your finger swipes. All of this sensitivity is anchored around where you leave the relative adjustment setting. Below that, the “Deadzone” controls the overall sensitivity of your swiping. The lower the deadzone, the longer it will take to completely dim or brighten your screen. The only thing Swipebright has going against it is its $1 price tag. When you consider that SBSettings is free and offers the same functionality, it’s hard to warrant the purchase of Swipebright. SBSettings requires multiple taps to get to adjust the screen brightness toggle, while Swipebright requires no tapping or system shortcuts — only a swipe. If that sounds utterly awesome to you, Swipebright can be found in Cydia for $1.